It’s gotten easier to pull a perfect shot of espresso at home if you’ve got the right equipment, but the other half of the latte and cappuccino equation—the foamed or steamed milk—can be much more difficult to achieve outside of the café. While manual milk frothing wands are cheap and easy to come by, the results are often less than satisfying if you’re used to the sweet, creamy milk served by your favorite barista. For buyers looking to replicate the café experience at home, there are now several options for frothing and steaming milk at home. Electric frothers take a lot of the guesswork out of preparing lattes or cappuccinos, frothing milk with the touch of a button. Still, many of these great machines have limitations that keep them from competing with the drinks you’d find at a coffee shop: for example, many models don’t actually heat the milk and instead froth milk that’s been heated separately. For me, this is a significant drawback: if I have to heat milk and then transfer it to another machine, this means twice the cleaning and additional work to make every drink. For this reason, my three favorite home milk steamers are all models that can heat milk to the temperature you’d expect for a latte or cappuccino, which is around 145° F. Of course, this also means that the price point jumps up significantly, but it’s ultimately a question of trading a higher initial investment for better performance. NOTE: You can also use these frothers for soy milk, almond milk, and coconut milk for an interesting substitute although the consistency isn’t always the same as milk. Although it’s the most expensive of these three milk frothers by far, the Breville Milk Café’s performance definitely justifies its price point. In addition to being much larger than its competitors, the Breville Milk Café also provides users with the ability to add ingredients directly to the frothing vessel, so you can make a rich and creamy hot chocolate or chai by adding syrups directly into the milk. 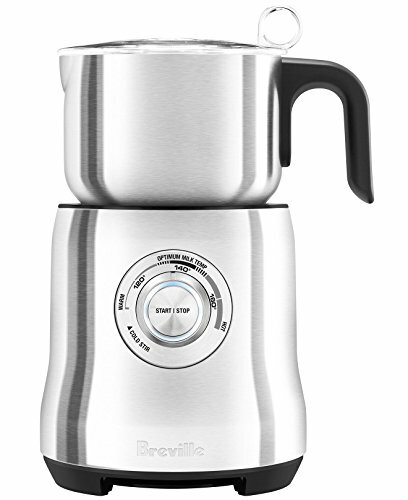 Largest Capacity: For steaming a large volume of milk, the Breville doesn’t really have any competition. It can hold a maximum of 16 ounces of cold milk for frothing lattes or cappuccinos, and can hold even more if you’re only looking to heat milk for hot chocolate or lattes. Easy Clean-Up: Because it heats through induction, the Breville Milk Café is dishwasher safe, which is another advantage over its competitors. Many other milk steamers require complete disassembly and hand-washing, so the ability to toss the steamer into the dishwasher is a big time-saver. High Heat Settings: The Milk Café also gets a lot hotter than many other home steamers: it can heat milk up to 170° F, which is perfect for extra-hot drinks and making cappuccinos and lattes. High Price Point: Most online retailers sell the Milk Café for about $129, which is more than twice the price of the other two milk steamers on this list. Size: Because the Milk Café has such a large capacity for foamed milk, it also takes up a lot more space than many other milk steamers on the market. You’ll need a lot more storage space if you intend to stow it away between uses, or a significant amount of counter space if you want to leave it out. Occasional Mechanical Issues: While the Breville Milk Café also has more advanced technologically than many of its competitors, some of that technology can occasionally malfunction. Some common issues are the milk foaming disc separating from its housing and a slight wobble between the top and bottom of the machine. In my opinion, the benefits of the Milk Café far outweigh the negatives. If you’re not on a budget, spending the extra money for the Breville will definitely pay off, and you may find yourself spending less at your local coffee shop because you can achieve the same drinks at home. Check here for the best prices on the Breville Milk Cafe. For buyers looking for an affordable and dependable automatic milk steamer, the Epica is a really handy model, especially if you’re only looking to prepare one drink at a time. It’s compact, so storage is less of an issue, and it has several features that make it a great choice for home baristas. Affordable: The Epica frother is about half the price of the Milk Café, and can sometimes be found for even less, and it’s very well constructed for its price point. If you’re not looking to break the bank, this is an affordable step up from a frothing wand. Hot and Cold Milk Settings: The ability to froth hot or cold milk makes this a really versatile machine. Some users even like to put the milk through a cold frothing cycle before adding heat to provide their drinks with extra volume. Operation is also very easy, with single button control over every setting. Vacuum Insulation: I love that the Epica is vacuum insulated to keep milk at a consistent temperature. You won’t lose heat after you froth your milk, which gives you extra time to pour and enjoy your drinks. Cold frothed milk will maintain its temperature, which is great for iced lattes at home. Capacity: The Epica frother can hold up to 250ml for heating milk, and 125ml for frothing. This definitely makes it a single-serving home steamer, and you may find that you want some extra capacity for making multiple drinks. 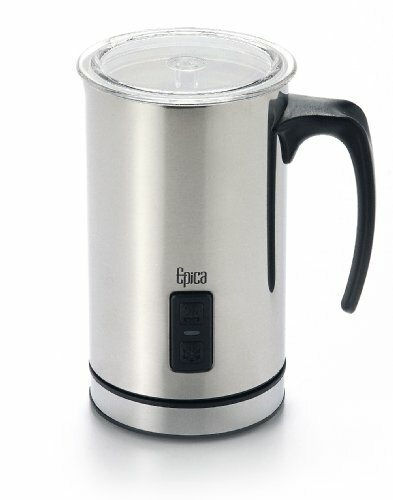 Cleaning: Although stainless steel is relatively easy to clean and maintain, the Epica can’t be submerged in water and is prone to buildup of burnt milk at the bottom of its vessel. Washing after each drink will prevent this from happening, but you may really need to scrub the frother. Low Temperature: Some users have reported issues with the Epica frother’s ability to heat milk to the right temperature for cappuccinos and lattes. It will heat milk to the bottom of the temperature range for hot drinks, but don’t expect to make an extra-hot latte with this steamer. The Epica milk frother is a great model if you’re just starting out with home steaming, but it does have some drawbacks. Still, it is easy to operate and doesn’t take a lot of space, so if you’re only making one drink at a time it’s a great home milk steamer. If you are interested in buying, check this listing. For a balance between price and capacity, a Secura is probably your best bet. While none of the available models steam as much milk as Breville’s Milk Café, the largest Secura definitely comes close to rivaling the pricier model’s capacity. Wide Range of Options: Secura makes frothers in several sizes, making it easy to find a model that suits your everyday home steaming needs. Steaming a single drink at a time? The 250ml model is your best bet. 300ml and 500ml models provide extra flexibility. Capacity: The largest Secura holds 500ml, which is enough milk to make several drinks at once. If you’re looking for a large capacity but a smaller home steamer, this is an excellent option that balances price and capacity. Affordable: You can buy the smallest Secura frother for around $40 online, which is a great price for steaming one drink at a time. The larger models aren’t much more expensive: even the large capacity frother is only $60, half the price of Breville’s Milk Café. Temperature: One of the biggest strikes against the Secura frother is the same as with the Epica: milk just doesn’t get hot enough. The frother will heat milk to the low level of the acceptable temperature range, but you definitely won’t get very hot drinks. Leaking: The Secura milk frother is particularly prone to leaks, which can leave your countertop covered in steamed milk. The seal between the rotary staff and the vessel seems to be the main cause of this problem. No Customer Support: Many users have reported issues with customer support from Secura. Hopefully this will never be an issue, but if your frother experiences mechanical issues, you may be out of luck when it comes to finding support or service. 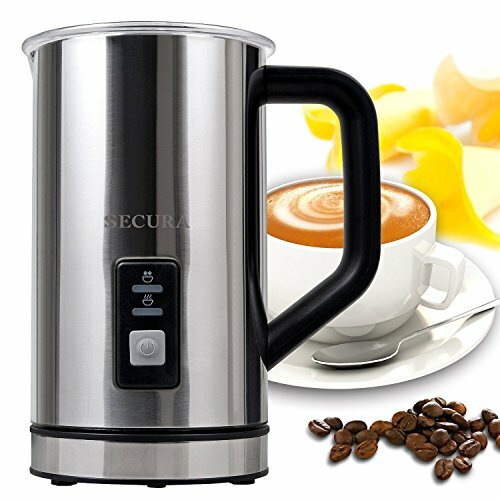 I like the Secura as an affordable but versatile home milk steamer, but I would want something a little more dependable for everyday use. Daily wear on the components can definitely exacerbate the leaking issues. You can check this listing for the latest pricing. I like all of these steamers, and any one of them would make a great addition to a home barista’s kitchen. Ultimately, the decision comes down to questions of price and capacity: if you’re only steaming a drink at a time, there’s not much of a need to go all out and buy a 3-cup steamer, but if you’ve got a whole family of latte drinkers, you’re going to want the extra capacity of the Breville or larger Secura.